The painting, known as Madonna and Child with the Infant, Saint John the Baptist, was created by an unknown artist, but is largely attributed to either Sebastiano Mainardi or Jacopo del Sellaio. It hangs on the walls of the Palazzo Vecchio in Florence in the Hall of Hercules, and has been causing a stir with UFOlogists for some time. 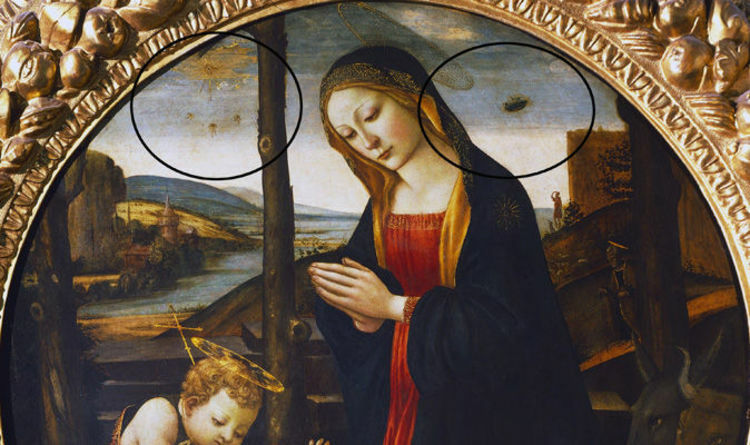 The round metre-wide painting shows Madonna, a baby Jesus and St John in the foreground, but it is what is behind them that piqued alien hunters curiosity. In the top right of the paining, a strange disc-like-object is seen, which has some believing is evidence of aliens. On the other side, in the top right, an “odd creature with tentacles” can be seen. For alien hunters, this is evidence that aliens have been visiting for some time. Website Ancient Aliens says: “The UFO is of the familiar dish or saucer shape with rays radiating from it, implying it is emitting light. “Also, in the upper left of this painting are strange creatures under the sun. Another close up is offered of these tentacle-like creatures. However, historians believe they have a more logical explanation to these sightings. Art website Florence Inferno states: “According to art historians the flying saucer is actually an angel bearing the appearance of a luminous cloud. This is not the first time an alien claim has been made about an ancient painting. Painted on the walls of the Svetitskhoveli Cathedral in Georgia is an 11th century portrait of Christ. The fresco painting shows Christ being crucified with a large crowd gathering around him, but in the top left and right corners are what appear top be flying crafts or some form of advanced technology which humans clearly would have not have had 2000 years ago. The ships are dome like, with three trails coming out of each which look like a propellant of some kind. Art historians who have studied the 11th century painting claim that the strange crafts actually represent guardian angels, however.